Today, December 17, 21015, marks exactly one year since presidents Obama and Raul Castro announced to the world that the US and Cuba would begin the normalization of relations after over 50 years of bad blood. The past year has seen an incredible amount of policy changes that wouldn’t have been possible without the hard work of Cuba solidarity activists like you. Yet the blockade of Cuba remains. On the anniversary of the historic announcement, take action to call for an end to the blockade! Join the Twitterstorm! Use the hashtag #D17CubaVa to join the conversation and get the word out. Call your Congressperson and tell them it’s time to end the blockade! The Congressional switchboard number is 202-224-3121. Ask them to connect you to the office of your elected official. 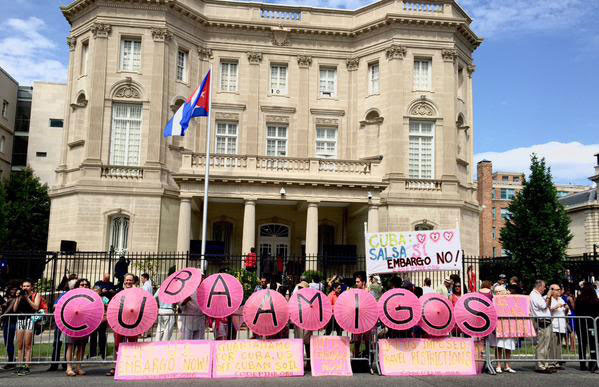 Check out our Cuba resource page on the CODEPINK website! Sign up to travel to Cuba with CODEPINK in February or May next year, an tell your friends about this amazing opportunity! This holiday season, get your loved one the present of a traditional Cuban men's shirt, a guayabera, made by a Cuban women's cooperative just for CODEPINK as a challenge to the blockade. One year later, the US is still enforcing a form of economic warfare meant to force non-American companies to cut business ties with the small island of Cuba. Just recently, the US imposed a $1 billion fine on a German bank for doing business with Cuba. In a United Nations plenary on October 28, 188 nations voted to condemn the US economic, trade and finance embargo that has been in effect against Cuba for more than 50 years. It has been denounced by the United Nations General Assembly for 23 years in a row! If the U.S. is serious about forging a peaceful and mutually respectful relationship with Cuba, it needs to end the blockade NOW! PS: January 11th marks the beginning of the 14th year of the prison at Guantanamo Bay Naval Base. The Cubans are calling for the prison and the base to be shut down, and we are too! Join CODEPINK at the annual action at the White House on January 11, 2016.